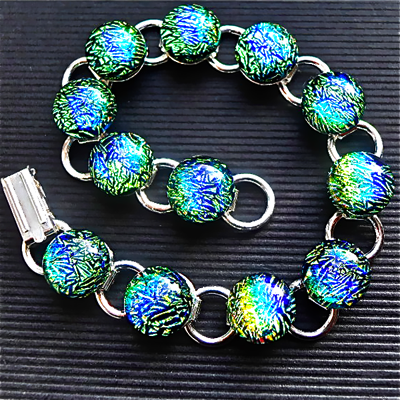 The bracelet is 20 cm long including the catch and each of the 12 glass pieces measures 1.2cm. They are made of two layers of glass - a layer of Blue/Green/ Black with a rainbow effect Dichroic glass, topped with a layer of clear glass. It's made of good quality plated silver and has a fold over catch. It comes in a Purple card bracelet gift box.